Since July 2011, I have been investigating an ongoing art mystery involving twentieth century modern impressionist master, Costantino Proietto (1910 – 1979). Among the most startling revelations, from the LoCastro family in New Jersey is that I have been spelling the artist’s name incorrectly. Originally, I understood his name to be “Constantino Proietto”, but after verification by two friends of the artist, I shall henceforth call him by his given name, Costantino Proietto. After spending over seven months coaxing Google to recognize his misspelled name, it will be interesting to see how long it takes for Google to shift their search algorithm back to the proper spelling. In order to assist them, I have changed all my previous mentions of C.Proietto on the internet to the proper spelling of his name. Many C.Proietto paintings that now reside in the United States originated in Stuttgart, Germany. Stuttgart had been an Allied bombing target during World War II, later becoming a major center for U.S. Military operations in Europe. Today, the 6th Area Support Group (ASG) is located in Stuttgart, providing command, control, communications and Base Operations to Headquarters United States European Command (EUCOM). Why the Sicilian born artist immigrated to Germany during World War II, we do not yet know. Judging by the number of people and paintings with ties to both C.Proietto and the U.S. Military, it appears that the artist lived in Stuttgart for many years. With the recent discovery of more new pictures, it appears that he painted real life locations. In order to create those scenes, the artist probably made many trips from Germany to Italy and Switzerland. I have one report that he painted within the walls of the Sistine Chapel, at the Vatican. This morning, when I opened my email, I had more good news. 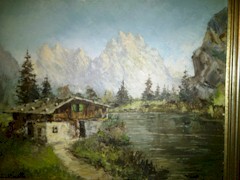 Peter Karns of Severna Park, Maryland provided images of two newly discovered C.Proietto oil paintings. Both works are family treasures, purchased by Peter Karn’s father, who served as an aide to a U.S. Army senior officer in Germany from 1944 to around 1946. Costantino Proietto’s skill in depicting the sky is unrivaled in modern impressionism. In his Swiss Alps scene, the artist blends the granite of the mountains with the sky above. In the coastal picture, he employs mist or fog to blend light and color between sea and sky. Although these images do a good job of bringing out the artist’s interplay with water and light, viewing the effect in his original works is even grander. In the near future, we expect to hear from more friends, family and collectors of Costantino Proietto. If any reader has pictures or information regarding the artist, please send an email or click on “Comments” below. 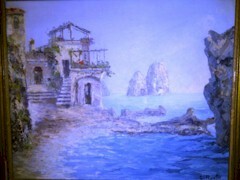 Because so many of his works included Italy’s Amalfi Coast, we once called the artist “The Man from Amalfi”. With so many new Costantino Proietto works now surfacing, we may have to add, “The Man from Stuttgart” to his biography. By dedera crockett on August 2, 2012 02:59 PM | Link to this comment. I too have one of C.Proietto's works. It came from the LoCastro family in New Jersey - would love to know the value. By Joan Dietrich on January 10, 2013 06:51 AM | Link to this comment. My family has a painting we believe may be a C Proietto. It was purchased by my father in Palma, Italy, in the 1970's. On the back in red it is marked "Golfo di Natali Capri Hotel, Della Palma, Italy. 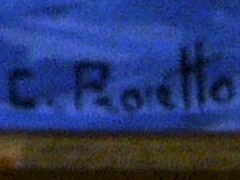 Signed C. Proietto. 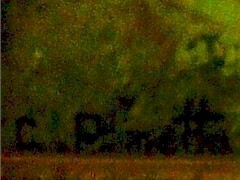 The first letter "P"/ looks like a "T". Any Idea how we could authenticate it?